A for Amazing location near the Champs Elysees and the rue du Faubourg Saint Honore; A also for the Artistic touches of the property. The boutique hotel Le A was designed by Brederic Mechiche as a town house sitting behind a 19th Century facade. The black and white decor provides an atmosphere of serenity simplicity and refinement. The hotel boasts comfortable and sumptuous 26 designer rooms equipped with all the modern facilities: satellite TV with a range of interactive features wifi internet air conditioning hairdryer adjustable lighting and electric blinds. The lounge with a library boasting a selection of Art and Design books and the bar under a 19th century glass roof will be the perfect places to unwind and enjoying a drink after a busy day sightseeing or shopping. A very nice hotel in a great location. The Le A is a Tourist hotel. 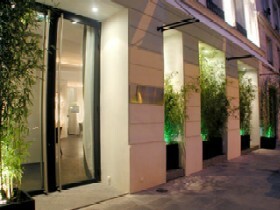 Located in City Centre - Champs Elysees area. Shopping is accessible by bus/taxi and the nightlife/restaurants are easily accessible by taxi or bus from the hotel. Descriptionclass="small" style="text-align: justify; font-size:11px;">A for Amazing location near the Champs Elysees and the rue du Faubourg Saint Honore; A also for the Artistic touches of the property. 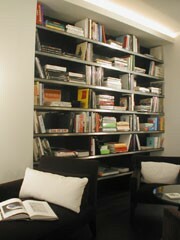 The boutique hotel Le A was designed by Brederic Mechiche as a town house sitting behind a 19th Century facade. 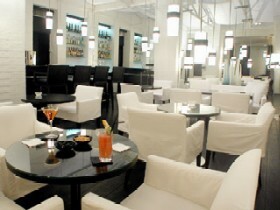 The black and white decor provides an atmosphere of serenity simplicity and refinement. The hotel boasts comfortable and sumptuous 26 designer rooms equipped with all the modern facilities: satellite TV with a range of interactive features wifi internet air conditioning hairdryer adjustable lighting and electric blinds. The lounge with a library boasting a selection of Art and Design books and the bar under a 19th century glass roof will be the perfect places to unwind and enjoying a drink after a busy day sightseeing or shopping. A very nice hotel in a great location.